In the simplest terms, Service Oriented Architecture (SOA) is a means by which unlike (or like) systems can communicate with one other despite differences between each system’s heritage. The goal of SOA is allow the owning enterprises to combine the functionality of these systems so they can apply the functions to their business needs. 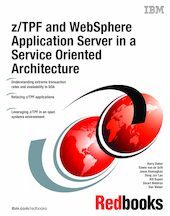 This book shows you how you can exploit z/TPF as a transaction server, participating in a Service Oriented Architecture (SOA) structure alongside WebSphere Application Server. After introducing z/TPF and the technologies critical to SOA, we position z/TPF as a provider in an SOA by explaining SOAP processing, communication bindings, and eXtensible Markup Language (XML) on z/TPF. Next, we show an SOA implementation example with z/TPF and WebSphere Application Server and discuss the use of z/TPF and Web services from a client perspective. We conclude with a discussion of z/TPF in an open systems environment. Chapter 8. Strategic SOA adoption at Marriott International, Inc.